Good morning: It’s a snowy Sunday (February 4, 2018), and everyone in America knows it’s SUPERBOWL DAY, when the Philadelphia Eagles will play the New England Patriots in Superbowl LII (info here). The venue is the hideously named U.S. Bank Stadium in Minneapolis, Minnesota. I still remember the first Superbowl, which shows how old I am. It’s also National Homemade Soup Day, but most Americans will be showing down on chips with dip, pizza, Buffalo chicken wings, and nachos. In California and Missouri, it’s Rosa Parks Day. Even if you don’t watch the Superbowl, though, be sure to catch The Kitten Bowl V here at noon eastern US time. As for the snow, I want winter to be over so my beloved duck Honey will return. I’ll be bereft if I don’t see her again. And, like the groundhog, I saw my shadow this morning when I emerged from my den, which means six more weeks of winter! Finally, it was on this day in 2004 that Mark Zuckerberg founded Facebook. Hili: Of course I will get inside, I just have to figure out how to do it. Hili: I do it on principle. Hili: Oczywiście, że tam jakoś wejdę, muszę tylko zbadać jak to zrobić. Here’s a pic of Gus in the snow. It’s been very cold so he hasn’t gone out much, but the other day he kindly went to see if the bird feeders needed filling. This is a bandaid for his problem but not a cure! Only in America would something like this sell! And a lovely picture of a blood moon. This entry was written by whyevolutionistrue and posted on February 4, 2018 at 6:30 am and filed under Gus, Hili Dialogue. Bookmark the permalink. Follow any comments here with the RSS feed for this post. Both comments and trackbacks are currently closed. First one, 1967 I think, the Packers and the Chiefs. It was played in the daytime and not the big deal they pretend now. Same teams repeated the following year. I use to pay attention to this stuff. In II the Packers won again, but I think their opponent was the Oakland Raiders. Yeah, they played those games in the daylight, someplace where it was warm. I used to pay attention in those days, too. Yes, why do they stretch the season into February when any sane person should be indoors with a cat, dog, and a warm fireplace? My theory, which is mine (and becoming true), is that some day the baseball, football, and basketball seasons will all overlap. At the professional level, I think they do. Basketball does not finish until around June, well into Baseball season and football is overlapping basketball now. Just out of interest, how many countries compete for the World Series? I think the total global count is one. The World Series last year was played during the last week of October (and, had a Game 7 been required, it was scheduled for Nov. 1st). The NBA season opener was on October 17, 2017, which corresponds to week 7 of the NFL season. So we have already arrived at the overlapping three-sport promised land. Your theory (which was yours) has been confirmed. Well, obviously I wasn’t paying that much attention. I am pretty sure they were not paying $3000 for a ticket in the cheap seats. The cost of going to one of these things is almost as obscene as politics. Off topic but just heard that Congressman Ryan tweeting out about a secretary who received a $1.50 a week raise with the new republican tax reductions. $78 bucks a year or less than Ryan makes in the congress in one hour. Like Trump says – biggest tax cuts in history. House Speaker Paul Ryan deleted a tweet Saturday touting the GOP tax overhaul after critics called him out for appearing out of touch with the reality of low-income individuals’ financial situations. The sarcasm goes right over Ryan’s poor little noggin. That reference to Dara Ó Briain made me laugh. I hope PCC(e) gets over his Honey blues soon, and I hope Honey comes back. I still remember the first Superbowl, which shows how old I am. – I think that is what you meant? I remember not watching the first superbowl. This is something I have done for every superbowl since. I did once go to a “Superbowl party” but I spent my time drinking beer and talking to people and not watching the game. You’re my kind of sportsman! The Patriots will almost certainly win, but I hope they lose since they have won so many. Eagles fans have a poor reputation, but even so I hope they win. Saturday Night Live had an especially funny skit last night about this whole issue, complete with parodies of the local accents. I saw a piece showing the competition between Boston and Philadelphia for more important city in revolution days. Now that one is more interesting and it might be a toss up. 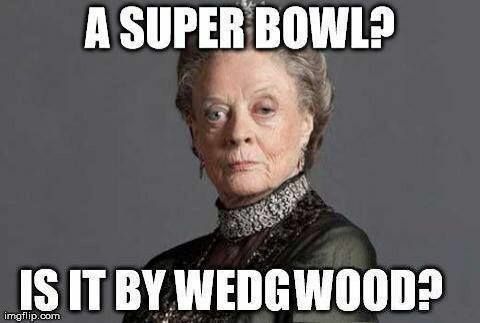 I’m so old I’ve forgotten the first Super Bowl. I must say, regarding that first election back in 1789, George Washington did not get news of the results by phone or twitter. He lived about 250 miles from Philly at his place, Mount Vernon. A Charles Thomson was given the task of riding to Mount Vernon to give Washington the news and to accompany him back to take the job. That was a journey of 8 days one way. The last Super Bowl I saw was in the early 1990s – Dallas and Buffalo I believe. Did not really watch it – was at a Super Bowl party. I do not like American football. I did not watch when the hometown Chicago Bears were in it about ten years ago, Like everyone in Chicago, I did watch the 1986 Super Bowl. I did watch Ireland-France play in the Six Nations (rugby) tournament yesterday. A wet miserable day in Paris. Not a very good game but a spectacular finish. Ireland has a new patron saint, Johnny Sexton. Thanks. Dara is my second favorite Irishman today after Johnny Sexton. Even if Dara is not a rugby fan. I can see Dara’s point of view re class. In an almost related way, I’ve given up on team sports EXCEPT for women’s teams. I’m hoping British sportswimmin will somehow [osmosis?] civilise the men playing & watching the male versions of the games! I’m following the Women’s Six Nations with great pleasure. I’m bored & disappointed by the boorish ignorance displayed on the pitch, on the stands, players & fans down the pub/nightclub etc. Not much has improved since the 70s & I’m done with waiting for blokes to grow up. I hate football, and I generally don’t spread memes, but double negatives cancelled with this one. I’m not interested in the Six Nations rugby either, but at least those guys play the game without all that ridiculous body armour. How many of those rugby players weigh well over three hundred pounds ? Not many, which is why play in Rugby Union is continuous for two forty-minute halves, rather than have the game stopped every thirty seconds so all can get their breath back after moving a yard or two in either direction. Actually none. Some props may go 260. You cannot drag that much weight around the pitch for 80 minutes. The Patty Hearst case would be a good hook for a free will discussion. the day in 1861 that the Southern Confederacy was formed in Montgomery Alabama. The sock tool is adaptive equipment to help people with injuries, strokes, or other medical conditions regain their independence – an important part of the healing process. Apparently all three terms are of superstitious origins, from a recent astrologer inventing the ‘super moon’ – which is not visibly different – to get more customers over the “blue moon” of religious fasting calendars [ https://en.wikipedia.org/wiki/Blue_moon ]to the recent invention of ‘blood moon’ by pastors to get more customers. “At the end of January was a striking example of fake astronomy news. A total lunar eclipse (visible in the western United States) occurred on Wednesday, Jan. 31. However, the headline for an article in the science section of The New York Times said, “Watch the Super Blood Blue Moon Before You Go to Work on Wednesday.” Although the eclipse part of the headline was true, the other elements were questionable. Leger is close to being my favorite artist. I think that cat painting is the best cat painting so far. Perfectly captures the look and spirit of the subspecies Little Black Cat. I own one of those sock things! Very useful when my back is playing up even more than usual. I hope you bet big Smokedpaprika because the Eagles won at the very end after one of the wildest games I’ve ever seen. The commercials were pretty much all made just for this game. The one I liked best was where ex-con Martha Stewart pulled off Jack-in-the-Box’s nose (in a fast food fight, of sorts). For those not in the know, Jack-in-the-Box is a fast food chain (mostly burgers). I am reading this latest from PCC (E) at 0530 and know who won. I know not from watching the game but from Yahoo news. I did watch the game, kind of, as I was reading Daniel Ellsberg and looked up at the replay of anything interesting.